COOL: St. John, EC1 | Everything is cool. There’s nothing quite like walking into a well revered meat restaurant in London, passing tables of excitable diners on your way to yours and feeling jealous as you sit down. Of yourself. Because you know that in about 24 hours, you’ll wish you could be back. That’s what happened when EIC visited St. John, Farringdon, on a cold December evening. The former smokehouse, situated around the corner from London’s Smithfield Market has in the past served various purposes; a squat, a greenhouse for harvesting bean sprouts, a Chinese beer store and a club. 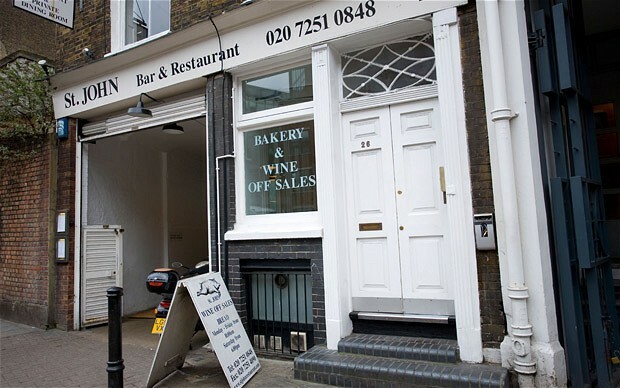 But since 1994 it has served as London’s top meat dungeon. Happily, at St. John’s, the smokehouse vibe prevails and it’s actually like sitting down to eat at a Butcher’s. White walls, no fuss, animals-are-definitely-slaughtered-here, kind of vibe. This is what sets St. John apart from other restaurants. You feel like you’re at the very source of the action. Is there a cleaver behind me? Where are the pigs? Am I one of the pigs? While the word ‘raw’ certainly comes to mind, there’s nothing bloody about the place. It’s clean, the chefs are clad in crisp white uniforms and the hip monochrome setting is no accident either. Simple yet effective, more comes to mind. And even though ‘simple’, ‘honest’, ‘stressed’ and ‘this place could cave in any second’ is so on trend and has been for yonks, owner Fergus Henderson seems only to be staying mindful of his own philosophy. “no plan, no roll out” just “purpose and simplicity”. There IS a lot of stuff you’ve never touched in your life cooking backstage and they haven’t gone to the trouble of hanging chandeliers and putting everything in a ‘jus’. You’ll just HAVE to trust that stuff like Ox Heart, Roast Middlewhite (pig) and bone marrow salad will look good enough to photograph, and taste phenomenal. And they do taste phenomenal because everything is cooked to perfection. For an establishment with a Michelin star, there’s very little fanfare at St. John. So if you’re looking to sample good quality meat, cooked intelligently, book a table in advance for your favourite carnivores, and the following morning, prepare to be green with envy as you scroll through your iphone pics. 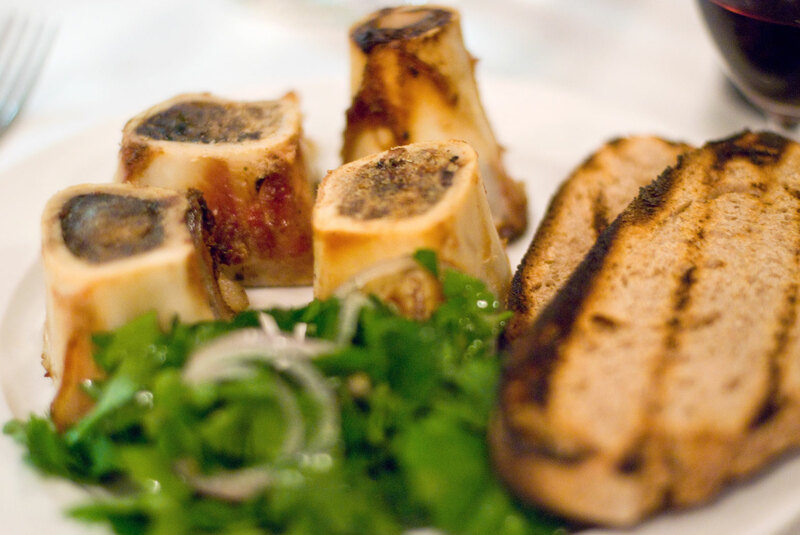 Bone Marrow and Parsley Salad. A St. John staple. St. JOHN is located around the corner from Smithfield Market in Clerkenwell.